Major-General Wade Hampton planned to attack Lower Canada by following the Lake Champlain route, while Major-General James Wilkinson planned to move on Montreal from Lake Ontario. The American chances to succeed looked very good. Hampton had 5,000 men, while Wilkinson had 8,000 men stationed at Sackett's Harbor. But, the two general's were bitter enemies and Hampton resented that he was to serve under Wilkinson. This was to be a well coordinated plan of attack, but ended up being one party ignoring the other to the detriment of the project. The planning of the campaign was disrupted by the arrival to Sackett's Harbor of John Armstrong , the secretary of war. Armstrong insisted that the attack be against Kingston, while Wilkinson perferred a direct assault on Montreal. When Armstrong finally agreed Wilkinson changed his mind and opted for Kingston and so it went. Montreal was finally agreed on as the primary objective. On 17 October, Wilkinson left Sackett's Harbor in a flotilla of bateaux and headed down the St. Lawrence River. At once bad luck came to the Americans in the way of a early snow storm, they became snowbound on Grenadier Island with a number of their boats being damaged beyond repair. While on the island Jarvis Hanks of the 11th U.S. Infantry remembered a farmer that still had potatoes in the ground. The men who as a rule do not care how they appropriate food offered the farmer fifty cents a bushel for the potatoes. The farmer said he could get a dollar a bushel for them from the British in Kingston. Well talk spread around the American camp that the farmer was suppling the enemy with potatoes so the men just took them, without paying any money at all. The farmer complained to the American officers but they did nothing to help him. He left thinking how unwise his decision was not to sell the potatoes for fifty cents a bushel. Wilkinson pressed on despite the cold weather. Part of his army was forced to march down the American side while the rest used the boats. .
News of the continued American movement reached Kingston, Sir George Prevost directed that, if the American force moved down river, the 49th and 89th Regiments should be sent in pursuit, under the command of Lieutenant Colonel Joseph Morrison of the 89th Regiment. His force consisted of 630 rank and file: nine companies of the 89th totalled about 450 men, but the battalion companies of the 49th Foot had been reduced by casualties to a total of about 160 men and there were less than 20 artillerymen with two 6 pounder field guns. On November 6th this force embarked on two schooners the "Lord Beresford" and the "Sir Sydney Smith" and seven gunboats and a number of bateaux . Naval command was entrusted by Sir James Yeo to his subordinate Commander William Mulcaster R.N., who was serving as a captain on Lake Ontario. General Wilkinson was now approaching Prescot. Since the guns of Fort Wellington commanded the St. Lawrence at Prescot, Wilkinson landed his army above Ogdensburg and floated the empty boats down river in the dark, the boats slipped quietly by the British guns at Fort Wellington. Wilkinson then re-embarked his troops. Whenever the Americans came to a narrowing in the river they were being shot at by Canadian farmers who were turning out as militia. Wilkinson ordered 1,200 troops to land on the Canadian shore at Iroquoois, below Prescot, as an advance guard to drive them off. This they succeeded in doing. The Americans reached Long Sault Rapids on 8 November. They deployed a force under Winfield Scott on the Canadian shore to oppose any attempt to interfere with the movement of the bateaux through the rapids. On 10 November Scott's troops along with Jacob Brown's brigade began to march on Cornwall leaving John Boyd's brigade to deal with Morrison's small force. Lieutenant-Colonel Morrison's pursuing force landed at Prescot on the morning of November 9th. His "corps of observation" was increased by a detachment of 240 troops commanded by Lieutenant Colonel Pearson. These consisted of two flank companies of the 49th Foot, a detachment of Canadian Fencibles, three companies of Canadian Voltigeurs, a handful of miltia artillerymen with a 6-pr gun and a half dozen Provincial Dragoons to serve a couriers. Captain Morrison now had about 900 officers and men. Commander William Mulcaster R.N. had to leave his armed schooners at Prescot but his gunboats pressed on to harass the American boats, as the American bateaux began to move through the rapids Mulcaster's gunboats opened fire and the small British force attacked. Meanwhile Colonel Morrison, had established his headquarters in John Crysler's farmhouse, he decided that he had a good defensive position should the Americans choose to turn on him. From the farmhouse a dirt road ran on right angles to the river as far as a swamp that was impassable a half mile inland. There were log fences that provided protection for the troops and in front of them was a large field of winter wheat. November 11th at 8 o'clock in the morning an alarm is sounded. An Indian had fired on an American reconnaissance patrol causing each side to believe that the other was about to attack. General Wilkinson ordered General Boyd to advance in three columns, Boyd had 2,000 U.S. troops. He was to outflank the British and capture their field guns. A force this large had no difficulties driving back skirmishers earlier, however the advancing American troops were stopped by the volley firing of companies of the 49th and 89th Regiments. The Americans tried to turn the British left flank but the 89th companies were swung around almost 90 degrees to counter this move successfully. The Americans became flustered when they realized that the men wearing the grey greatcoats were not militia, but were the 49th Regiment of Foot. The order came to advance and Major Charles Plenderleath of the 49th Regiment led his troops against the American guns 120 yards in front of them. All of a sudden to the right of him a troop of American Dragoons were seen galloping down the King's Highway toward their position. If they could get behind them they could charge their rear turning the tide of the battle against them. Captain Ellis's orders to his company on the right flank were, "Halt ... front... pivot...cover... left wheel into line... fire by platoons from the center to the flanks." Ellis had wheeled his company backward to the left to face the cavalry. Ellis waited as the cavalry charged down on his men, then smoke and fire erupted from the British line shattering the American charge and eliminated the threat. Captain Ellis held his fire to that last moment to maximize the effect. His company wheeled back to the advance and the 49th captured the American guns. The Americans were forced to withdraw from the field and that night crossed back across the river to the American side. 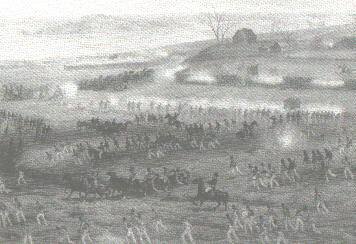 The army pushed on to make their junction with Hampton's army beyond the Long Sault, but Hampton, having been defeated at Chateauguay, refused to meet Wilkinson at St. Regis. Wilkinson, ill and discouraged, abandoned the campaign. Lieutenant Colonel Morrison's troops had defeated the Americans that day against overwelming odds, however there was one American unit that caught his eye. He was so impressed with the U.S. 25th infantry's steadiness in battle that he sent a note to their commander, Colonel Edmund Gaines, hoping that they might meet after the war as friends. Morrison reported his own casualties for the Battle of Crysler's Farm as being 22 killed, 148 wounded and 9 missing. General Boyd reported 102 killed, 237 wounded and more than 100 missing. On the Niagara Frontier the humiliating defeats of Stoney Creek and Beaverdams forced the Americans to withdaw into Fort George. The victory at the Battle of the Thames did little to lift morale of those American troops on the Niagara Peninsula. Foraging parties were ambushed and Merritt's Dragoons harassed pickets and patrols alike. The pickets were especially vulnerable to Indain attacks that kept them constantly in a state of agitation. The scene was now set for one of the most callous acts of the war, the burning of Newark. An act that would have far reaching effects for Americans living on the east bank of the Niagara. CLICK HERE to see the plaque of this battle. CLICK HERE to see the plaque dedicated to Lieutenant-Colonel Joseph W. Morrison.